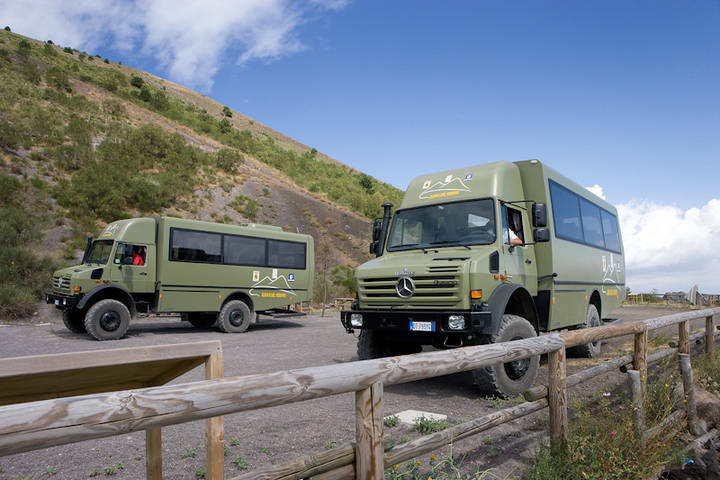 Busvia Vesuvius is a branch of the Cooperative Torquato Tasso in Sorrento which was exclusively assigned the tourist transport along the road Matrone, one of the oldest tracks of Mount Vesuvius through the appropriate ecological bus. 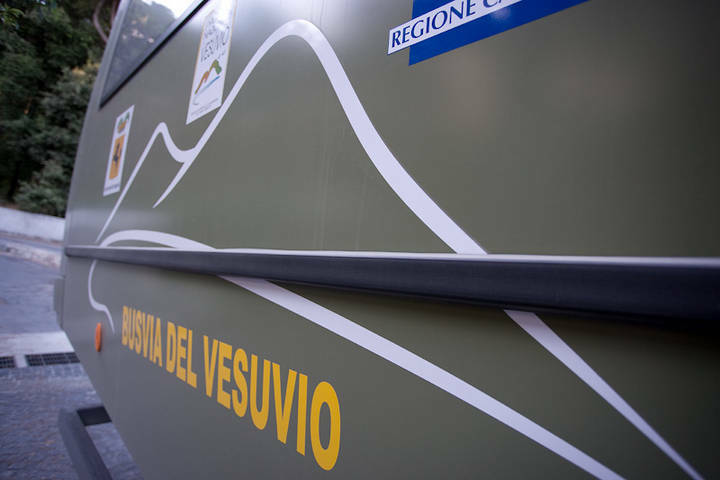 Each year, the Vesuvius of Busvia bus carrying more than fifty thousand travelers on the most famous volcano in the world. The Busvia vehicles are the only bus that can travel along the road Matrone and can carry up to 25 tourists at a time. Despite their size the of Busvia bus respect nature thanks to reduced CO2 and noise emissions. Also the color of the shuttles is designed to avoid bothering the fauna in the park. Ciasciun means is equipped with all the safety standards. 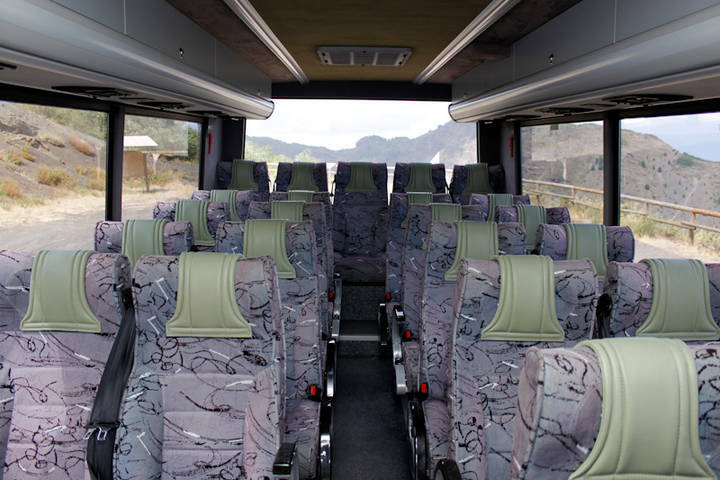 Each seat has a headphone and a plasma screen which allows visitors to learn about the history and curiosities of Vesuvius and the national park. The languages spoken are: Italian, English, French, German and Spanish. 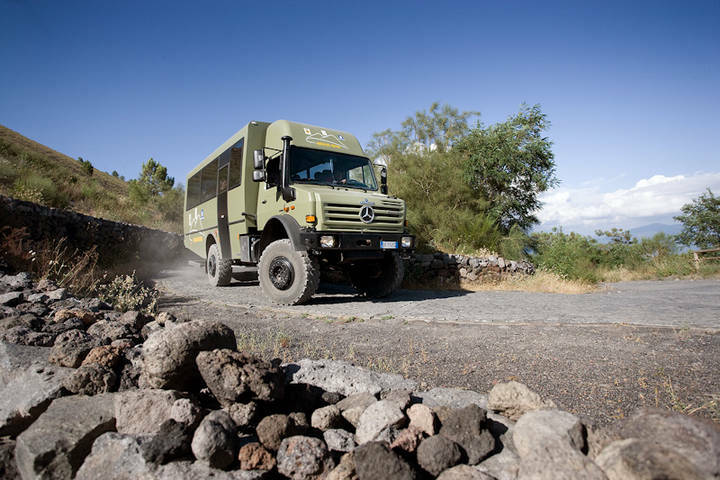 Vesuvius, after more than twenty years, finally found one of his most evocative locations, as well as one of only two viable ways by bus ecological park to reach the Gran Cono, an alternative to the known route that starts in Herculaneum. Shore service was inaugurated on 6 May at 12.30 am at the headquarters of the City of Boscoreale (Peace Square) in the presence of Economy Undersecretary Nicola Cosentino, Antonio Bassolino the governor, to the Regional Transport Ennio Cascetta of Provincial President Dino Di Palma, the Assessor for the provincial Transportation Mario Casillo, president of the National Park of Vesuvius Ugo Leone, along with its predecessor Amilcare Troiano (now president of the National Park of Cilento and Vallo di Diano), the mayors of Boscoreale , Boscotrecase and Trecase, ie respectively Gennaro Langella, Agnes Borrelli and Gennaro Cirillo, and Antonio Zumbolo representing the Forestry Corps. Born in about 1970 by the will of some Sorrento taxi drivers, The Cooperative Tasso has become what it is today thanks the audacity, the skill and the determination of the defunct founder and coordinator Ronca Mario, better known as Mario l’Amalfitano. One of the goals for which the cooperative is born was to avoid to transform our wonderful town into a bustling metropolitan center, since, due to its geographical formation, full of small streets that still witness the Roman period, it does not fit to big tourist busses, and that’s how year after year Sorrento gained the actual structure, that we helped to model toghether with local authorities, to match public utilities.